The legend is so widespread that it is even told in the faculties of mathematics worldwide. If it were true, it would be the answer to the question of why there is no Nobel Prize for mathematics, a discipline that is without doubt equivalent to any other of the others that are granted a Nobel, one of the most prestigious awards in the world. The unofficial reason for why this happened is due to jealousy on the part of Alfred Nobel, the inventor of dynamite and founder of the prizes that bear his name, who did not want to reward this discipline because his wife’s lover, a mathematician, might win it at some point. The reality is that Nobel never married and the story is false. What is certain, however, is that there is no Nobel Prize in Mathematics, nor is there one for many other disciplines that the Swede omitted when establishing the famous awards. The ‘discriminated against’ disciplines have not taken this lying down. Currently, almost all of them are recognized with prizes that, even if they do not in most cases reach the financial value of the Nobel (one million dollars, 812,000 euros), they are comparable in prestige. The paradigmatic case is the Fields Medal (actually, four are granted) in the discipline that Nobel vetoed for his supposed jealousy. Awarded by the International Mathematical Union, the medal distinguishes outstanding discoveries in mathematics. Architecture is another major discipline absent from the Nobel categories but, once again, another prestigious award has remedied the situation. In this case it is the Pritzker Prize, organized by the Hyatt Foundation and worth $100,000. Some other lesser-known disciplines, also absent from the Swedish list of winners, have their own private prize. This is the case for environmental epidemiology, which is recognized with the John Goldsmith Award from the International Society for Environmental Epidemiology (ISEE), which this year has been awarded to the Spaniard Jordi Sunyer. But if there is an environmental award that can be equated with the Nobel, it is the Goldman Prize, which is awarded annually as a reward for defenders of nature and the environment and is divided into six categories according to the geographical area: Africa, Asia, Europe, the island nations, North America, Central America and South America. Convened by philanthropists Richard N. Goldman and his late wife, Rhoda H. Goldman, it is worth $150,000. In a survey conducted by the website Livescience, leading scientists were asked what disciplines were notably absent from the Nobel prizes. Besides mathematics, two others were most mentioned and both have prestigious awards to offset the ‘error’. They are technology and the social sciences. It is obvious that when the Swedish scientist decided to bequeath his estate to establish the prizes that bear his name, technology had no importance at the time. In 2002, the Finnish Academy of Technology established the Millennium Technology Prize, which is endowed with the exact same amount of money as the more famous awards in the neighboring country, one million dollars. Its goal is simple: reward groundbreaking technological innovations that substantially improve the quality of life of people. Among the winners are people who have certainly achieved that impact, such as the inventor of the World Wide Web, Tim Berners-Lee or the Linux operating system, Linus Torvalds. As for the social sciences, there are several awards that recognize the advances in this field. The Albert O. Hirschman is probably the most prestigious, but it has no financial endowment. In 2007, the Chinese entrepreneurs Shu Kai and Angela Chan launched the A. SK Social Science Award, a prize endowed with €100,000. But there is a prize that includes everything that is not recognized by the Nobel. In fact, it is known as the Alternative Nobel and there are some similarities with the original. Firstly, the Right Livelihood Award shares the same nationality as the Nobel; secondly, it is also physically handed out in Stockholm, at a ceremony in the Swedish parliament. The main difference concerns the category: these awards are not divided into disciplines, but rather the prizes are awarded “for outstanding vision and work on behalf of our planet and its people.” The second difference is financial: the prizes are endowed with 500,000 Swedish crowns (just over 50,000 euros), which cannot be devoted to personal use. It is impossible to finish a discussion of the other Nobel-like prizes without mentioning the Nobel’s comic antagonists. 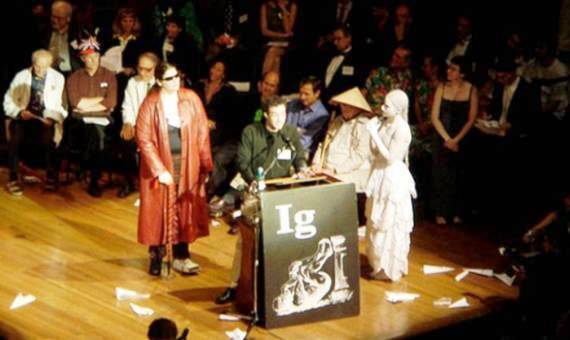 The Ig Nobel Prizes, awarded for investigations that make you laugh and then think (according to the definition on its own website) are given out annually at Harvard by real Nobel Laureates who, although they take the Nobel award very seriously, do not hesitate to laugh at its antagonist par excellence. In Spain we have our own version of the Nobel Prize: The BBVA Foundation Frontiers of Knowledge Awards, which has an endowment of 400,000 euros, and recognizes and promotes research and artistic creation. The awards have been presented since 2009, and reward particularly significant contributions either to scientific research (in Basic Sciences, Biomedicine, Ecology and Conservation Biology, Information Technology and Communication, Economics, Finance and Management), artistic creation (Contemporary Music), or the analysis and / or practical action in the field of climate change and development cooperation. These last six editions of the BBVA Foundation Frontiers of Knowledge Awards have already included four Nobel Prize winners: Robert J. Lefkowitz, BBVA Foundation Frontiers of Knowledge Award in Biomedicine 2009 Nobel Prize in Chemistry 2012; Shinya Yamanaka, BBVA Foundation Frontiers of Knowledge Award in Biomedicine 2010 Nobel Prize in Physiology or Medicine 2012; Lars Peter Hansen, BBVA Foundation Frontiers of Knowledge Award in Economics, Finance and Management 2010 Nobel Prize in Economics 2013 and Jean Tirole, BBVA Foundation Frontiers of Knowledge Award in Economics, Finance and Management 2008 Nobel Prize in Economics 2014 .